Highly skilled professional nurse with the ability and desire to manage a nursing department and provide quality care to all residents in accordance with federal, state, and local guidelines. Responsible for the overall management of the Nursing Department. Coordinate with other disciplines to provide quality care to all residents. Directly responsible for the supervision of 75 nursing staff. Ensures the nursing staff is adequately staffed to provide quality care to residents. Responsible for hiring and termination of employees. Responsible for new employee orientation. Responsible for the education of all nursing staff regarding current infectio contrl practicies. Identifies clinical prblem areas and coordinates the development of plans of correction. Staff the nursing department at at a level congruent with resident needs, state and federal requirements, budgeted positions and employee requests. Ensure all facets of the nursing budget are within the established parameters. Ensures a process of intermal review of nursing practices and develops and implements plans of action to correct any problems. Conduct random audits of nursing charting to ensure compliance with federal, state, and local regulations. Direct and supervise care provided by other nursing personnel. 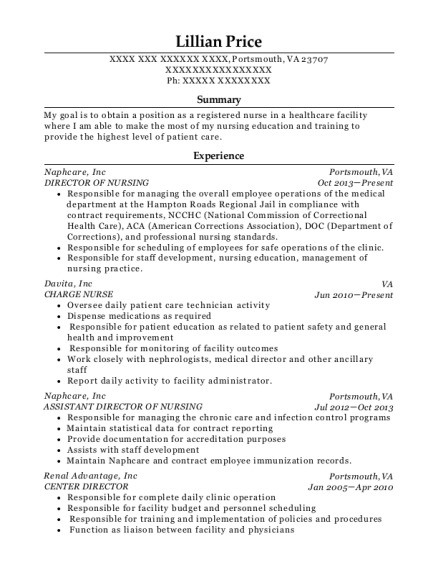 Assess, plan, and evaluate nursing care delivered to resident requiring long-term and/or rehabilitation care Initiate nursing individualized nursing care plans. Assist with the assessment of residents with changes of condition. Perform duties as Director of Nursing during their absence. Prepare and submit clinical reports on a weekly and monthly basis. Assist to ensure facility is adequately staffed for each shift. Participate in the hiring and firing process. Ensure staff adherence to company policy and procedure. Perform disciplinary actions for violation of company policy. Compassioncare Hospice - Las Vegas, NV Responsible for all after-hour patient visits for a census of 135 patients. Performed routine and emergency facility and home visits. Performed admissions and discharges. Provided patient and family education on disease process. Provided wound care. Collaborated with on-call physicians regarding changes of condition and changes in orders. Responsible for completion of admissions and discharges during my shift. Initiated individualized plan of care for each resident. Provided direct bedside care in accordance with plan or care and physician orders. Initiated emergency transfers for changes in condition requiring a high level of care. Ensured resident charting was completed in accordance to regulatory guidelines. Served the armed forces for ten years in a senior management capacity in a high demand fast paced environment and supervision of twenty. 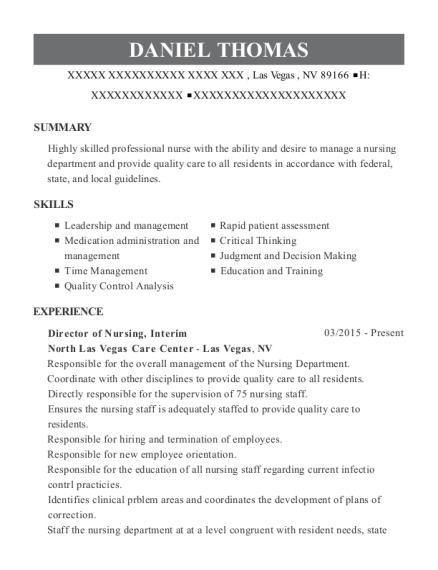 This is a resume for a Director of Nursing in Las Vegas, Nevada with experience working for such companies as North Las Vegas Care Center and North Las Vegas Care Center. 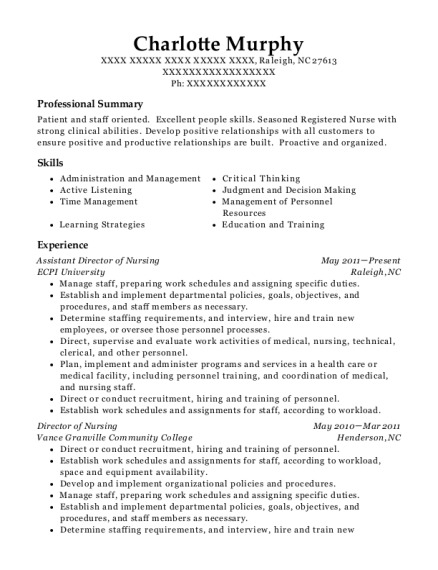 The grade for this resume is 0 and is one of hundreds of Director of Nursing resumes available on our site for free. 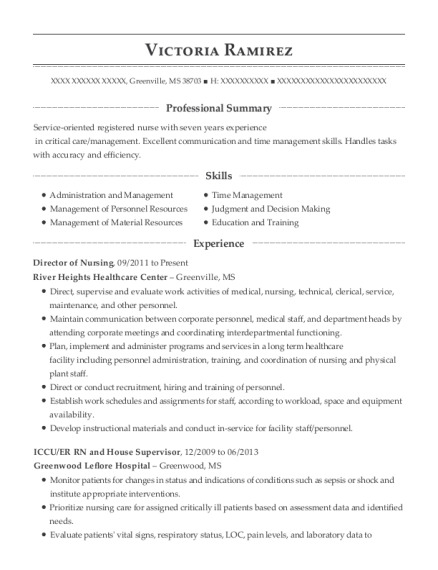 Use these resumes as templates to get help creating the best Director of Nursing resume.